The Taboo star has set up a JustGiving page to support those affected by Monday's attack at the Manchester Arena. Tom Hardy has launched a fundraising page to support the victims of the Manchester terror attack. The actor has responded to the horrific events, which saw 22 people killed by a suicide bomber who targeted an Ariana Grande gig at the Manchester Arena on Monday (22 May) by launching a JustGiving page for The British Red Cross Society. 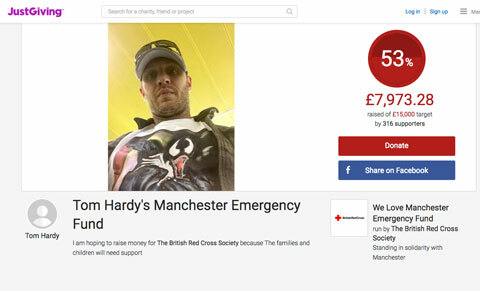 On his campaign page, entitled Tom Hardy's Manchester Emergency Fund, the Taboo actor explains: "I am hoping to raise money for The British Red Cross Society because The families and children will need support". The Revenant star wrote in the story section: "I hope between us we can raise some funds as a gesture of goodwill and love to help in some small way towards repairing some if any of the damage done in the wake of last nights events. There will be much to do and for many the beginning of a new life without those that they love and also a new life damaged irrevocably by the actions of a crime which has no reason, no heartfelt purpose but was simply a cruel cowardly and barbaric, meaningless act of violence. A road to recovery unimaginable." Hardy has raised 37,973.28 of his 15,000 total so far.